As you may or may not know, I have a newsletter I’ve been sending out since May 2016 on a roughly weekly basis. If you want to keep up with what I write at the day job and the most interesting links I find while procrastinating at my day job, consider subscribing: Rowley.Report. Considering it’s Halloween and all, I figured I should share some of the tips and tricks I use to produce that content. You have to understand that to produce something like that every week, an elaborate conjuring ritual is involved. Trick or treat? Start by arraying five beeswax candles in the shape of an upside down star on the floor. 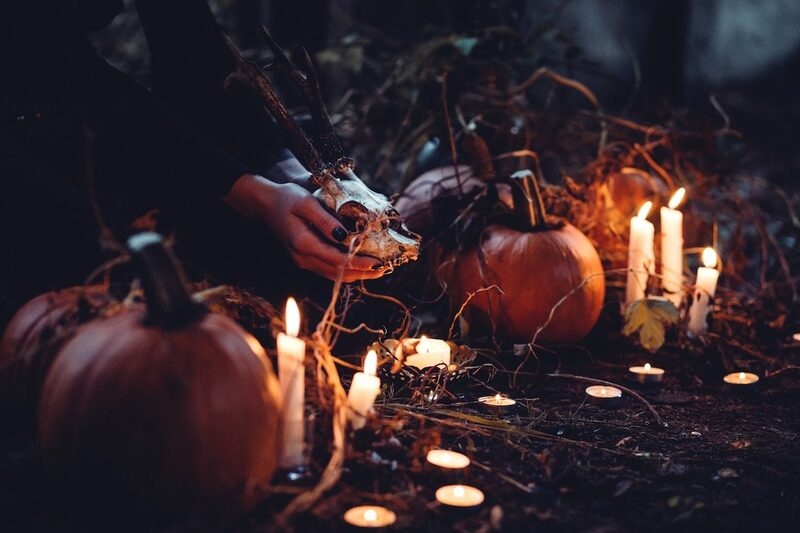 Light the candles. Fashion a miniature boat out of cocktail bar coasters and glue, and use one of the heavy metal pens they give you to sign your bill at the Rosewood as a mast. Print out the most recent leaked term sheet and fashion it into a sail, affixing it to the makeshift boat. Anoint the small boat with samples of billionaire founders’ blood, sweat, and tears. Place the boat in the middle of the inverted star on the floor. Burn and scatter the ashes of one of the last remaining hard copies of Georges Doriot’s Manufacturing class notes into and about the small boat. For safety, blow out the candles in your house and take your boat to the nearest body of water, ideally while riding a Bird or Lime scooter. Short-circuit one JUUL e-cigarette battery such that it begins to heat up, and place it in the boat. Also place a USB stick containing the weekly output of charts and all items, read and unread, from my RSS feedreader. Summon the Owl by hooting vigorously toward the blackness of the woods. Speak of phenomenal risk-adjusted returns with it, in tongues, until sunrise. Kind of all in one fell swoop: Merge accumulated notes in iA Writer & Drafts 5 into a new document; edit markdown in iA Writer; in iA Writer, left-swipe with two fingers to reveal well-rendered and semantic HTML; copy; paste into new Mailchimp email campaign. edit: So, MarsEdit pushes content directly to the blog. Not to drafts like I’d hoped. Glad I found out, and thanks for clicking. Shameless plug: If you’d like to read more about what I write on this blog and the blogs of others (like at Crunchbase News, my day job) you should check out my weekly-ish newsletter. Earlier today, Apple announced a raft of new phones, which no doubt will excite a lot of people. Apple also announced a new version of its Apple Watch today—Series 4. 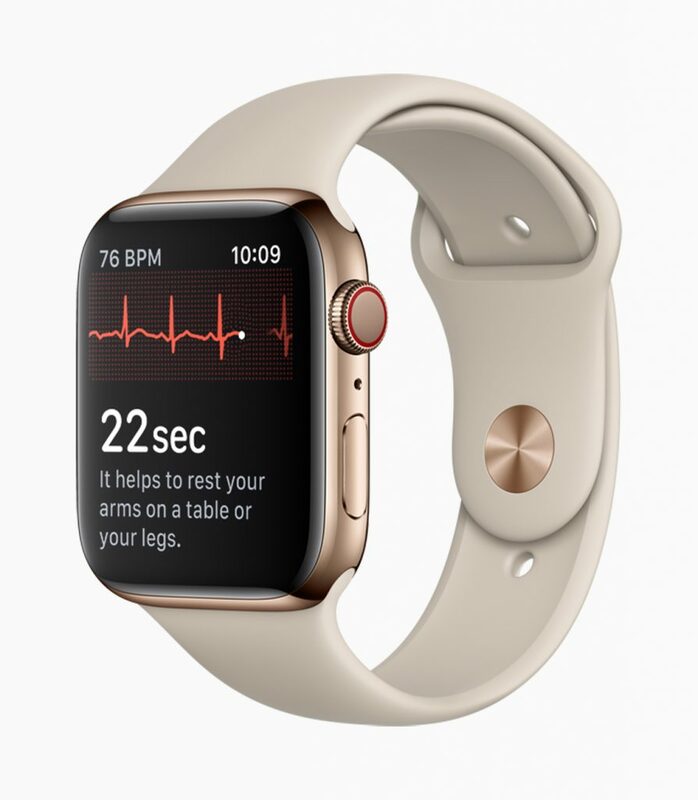 One of the watch’s new features is very near and dear to me: the conductive pads on the back which help the watch capture electrical activity and display it as an electrocardiograph. At the time, there were no tools to monitor heartbeats over long periods; so they invented one. They worked with an undergraduate student at UChicago and a watch repairman to convert a spring-wound pocket watch into a portable pulse counter and built tiny electrical sensors that could be glued reliably to the chest—the first gel electrodes. The gadget later would be scaled up with help from the Elgin National Watch Co. and Illinois Bell Telephone. No longer a wind-up device made of watch parts, a descendent of my grandfather’s ticker-tracker lives on in watch form, which I think is pretty wild. There have been many programs that build upon Markdown’s principle of readability in pure-text formatting, and I wanted to share a couple of them here. Since issue #2 of my newsletter, I’ve written almost everything in Markdown, the text-to-HTML conversion software originally written by John Gruber, the Daring Fireball himself. It’s shockingly easy to use when you get the hang of its syntax. Fortunately, there are a number of “cheat sheets” available to help you get started if you’re not familiar with it. I personally prefer writing in Markdown (specifically MultiMarkdown) on a plaintext editor to writing in a WYSIWYG environment these days because it’s a little closer to the metal and gives me a lot of options for how I want to share my work. Since the original release of Markdown, a lot of developers have built Markdown editors into their software to excellent effect. Since Markdown was originally built by and for writers, it’s no surprise that it’s used as the markup language of choice for Github pages, blog posts on Ghost and other blogging platforms, and other places where text is written and published on the web. There have been many other programs that build upon Markdown’s principle of readability in pure-text formatting, and I wanted to share a couple of them here. Dillinger.io is a simple, web-based Markdown editor with a pane that renders your Markdown as formatted HTML in really-close-to-real-time. It’s a great site for playing around with Markdown for the first time. iA Writer, is a minimalist and un-opinionated Markdown editor for MacOS and iOS, and it’s been my Markdown editor of choice basically since it launched. I first used it on my first generation iPad with that amazing keyboard dock, and continued to use it as iA built the Mac app and built out the feature set. One of my favorite features of iA Writer is its syntax highlighting. Unlike with a code editor, iA Writer lets users highlights English words based on the part of speech they represent. So, if I’m working on a sentence that’s lexically dense, I’m able to visualize its bits and pieces to ensure that I’m not veering too deeply into run-on territory. It also features easy integration with Dropbox and iCloud Drive, full-screen editing, metadata support by way of MultiMarkdown, a range of export modes, easy image/file embedding, and custom document templating for PDF exports, a feature near and dear to my heart. 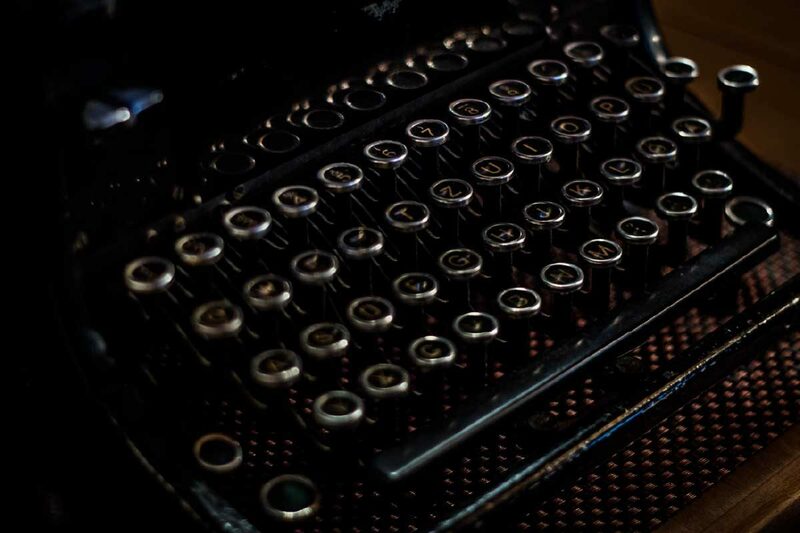 There are other Markdown-driven editors out there, including Ulysses and Scrivener, which are geared toward toward users who want more software-based assistance with project management and organizational structure. I’ve tried Ulysses and quite liked it, but I still prefer iA Writer’s somewhat hands-off approach. At time of writing, iA Writer is still my tool of choice for writing my weekly-ish newsletter. It’s one of the best pieces of software I use and can’t recommend it highly enough. Marp is an open source, cross-platform editor for making presentations using Markdown. It utilizes Github-flavored Markdown’s syntax and a simple text editor with more traditional syntax editing and so-called “directives” for how Marp’s rendering engine treats pagination and aspect ratios. To that end, using Marp, you can set aspect ratios for standard paper sizes in A and B 0-8, as well as other popular aspect ratios. For now, the software is still in a pre-release beta, and it lacks some of the features of more fully-developed Markdown presentation apps like Deckset or the Remark.js library, but it’ll be interesting to see where the project goes. I am a big, big fan of Markdown, and since it’s become the default plain-text input syntax for extremely popular websites like Github, reddit, Hacker News, StackExchange and others, it seems to have cemented itself as the default standard on the web. However, like anything that isn’t purely WYSIWYG, Markdown still feels like a thing for programmers, power-users and professionals. This reputation, to me, feels somewhat undeserved because, again, it’s really freaking easy to pick up. So, if you’ve never tried writing in plain text like this, give a Markdown editor a spin. There are literally hundreds of great options out there. I forgot where I heard this, but on some or another podcast it was declared that “Microsoft Excel is the gateway drug to programming.” And I’m coming to believe this more and more. I’m someone with more than a passing interest in programming who simultaneously lacks any serious proficiency with writing code. Irony of ironies, right? Also, I’m now in this weird liminal space between being really good at manipulating data in a spreadsheet-type environment and seeing the possibility of what I can do with a real programming language while still sorely lacking in the practical know-how to get a lot of things done. And that’s why I’m still tied to using Excel and Google Sheets for a lot of my data analysis work. Both are fine tools, albeit with their own quirks and limitations. Although Excel is good for the kind of work I do, which typically involves big CSVs that Google Sheets kind of chokes on, I strongly prefer Google Sheets for its more expressive functions and easy connectivity to outside data stores, including Google’s own services. It’s for this reason that I’m going to be covering the subject of creating abstract, auto-generating formulas in Google Sheets only. Also, I’m like 90% sure one can’t use CONCATENATE() in Excel for the use case I’m presenting here, but I’d love to be proven wrong. 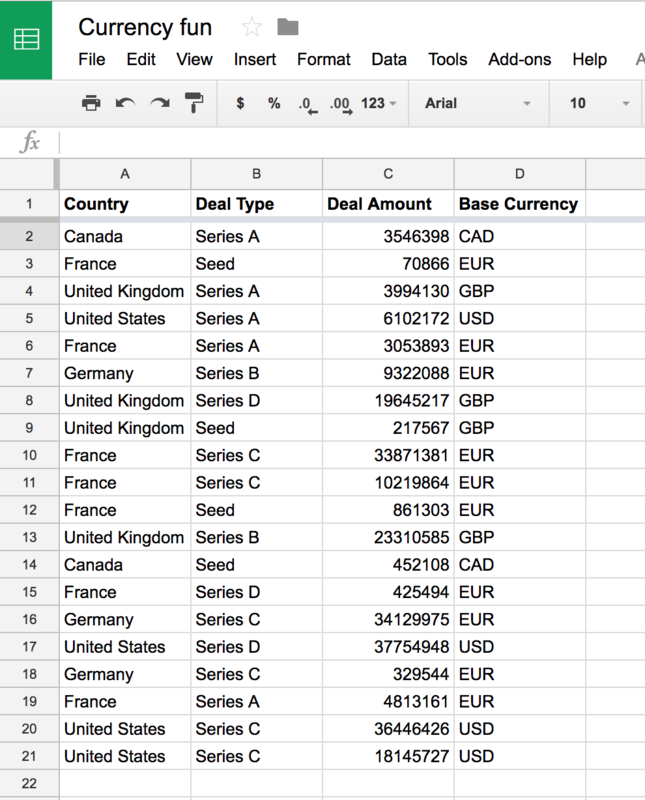 Part of my job is to analyze venture capital data, and oftentimes the scope of my analysis expands beyond US borders. Accordingly, I often have to deal multiple currencies, which can be a pain. Remembering that our dataset can be arbitrarily large, what’s the easiest way to convert those foreign currencies into USD so we can make comparisons on equal terms? Below, to avoid using proprietary data, I fabricated an array of 20 sample deals using a random number generator and multiplying its output by different scalars depending on the round type. The size of deals do not necessarily correspond to any real-world averages and are here for demonstration purposes only. Also, I picked 20 rows because it’s small enough to fit in a screenshot. 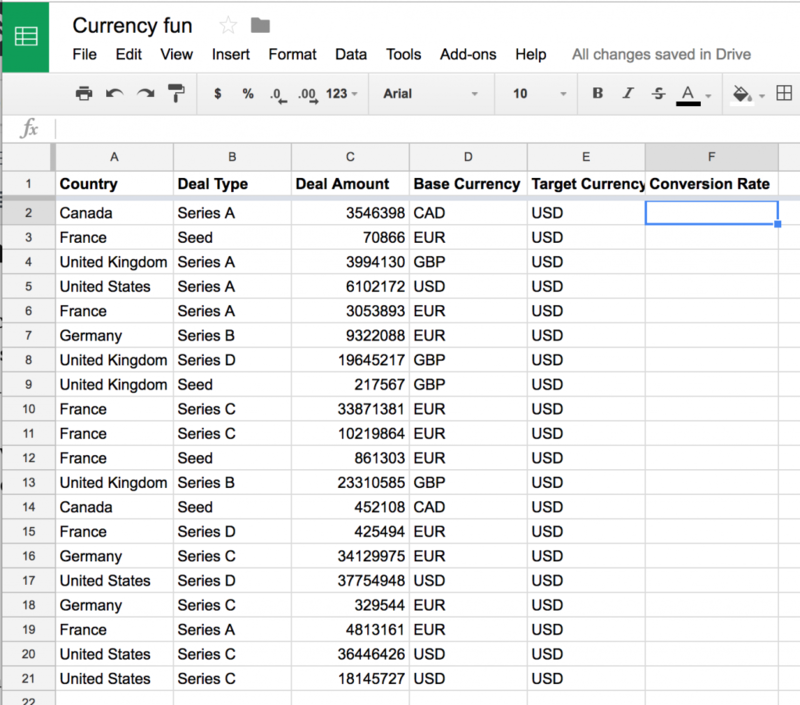 For a sample size of 20 rows, it’s still easy to do all the conversions by hand sorting, but the ideal solution would scale to sheets with hundreds or thousands of rows and a huge combination of currency conversions. This is why we’re going to emphasize abstraction here. We have several choices for how we want to make the conversions of foreign currencies to USD. Here, I’ll share three ways, with each successive option being more abstract and scalable than the last. Let’s say you’re a masochist with a fetish for tedium and frustration. This is the method for you. Remember, I said “masochist” and not “primitive cave dweller” here, so I’m going to run on the assumption that, being an enlightened user of spreadsheeting tools, you understand how to sort columns. So we start by sorting the “Base Currency” column to make things at least somewhat easier to deal with… Note how all the base currencies are now grouped. Now for the brute force part. 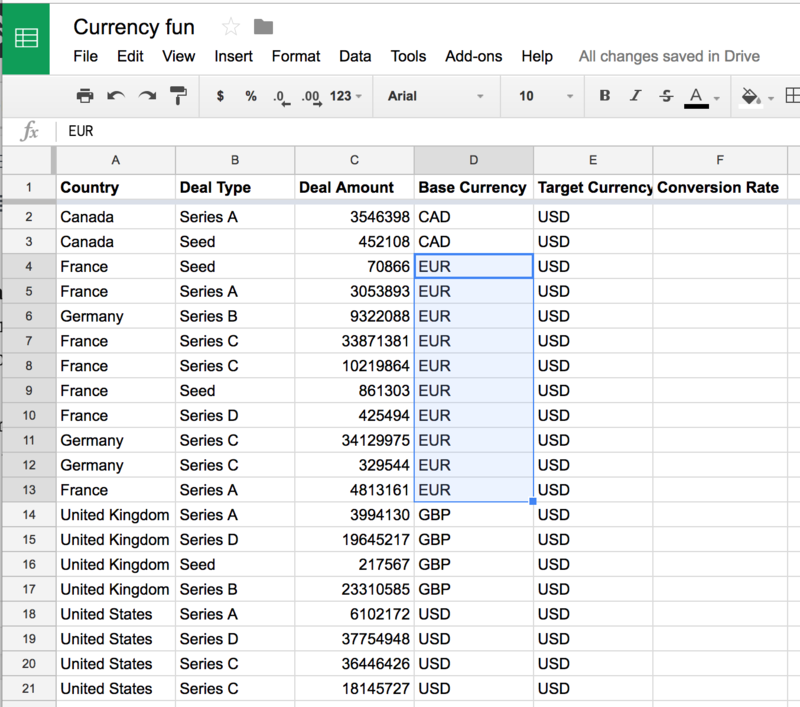 We search Google for each conversion pair (“CAD USD,” “EUR USD,” etc. ), copy and paste the ratio into our spreadsheet, and manually fill down. For this small sample set, it took me almost exactly a minute to build a conversion column using brute force. But this is only for a small handful of currency pairs. If I was dealing with dozens of pairs, this would have been a much bigger task. Like I may have mentioned earlier, one of the nice parts about Google Sheets is that it gives users direct access to some of Google’s services directly through a series of bespoke functions. For example, the GOOGLETRANSLATE() function lets users translate strings in spreadsheets from one language to another using the Google Translate engine. In conjunction with DETECTLANGUAGE(), one can generate some interesting formulas. But here we’re going to talk about the joys of the GOOGLEFINANCE() function. And Google automatically returns that information and builds a table to display it. 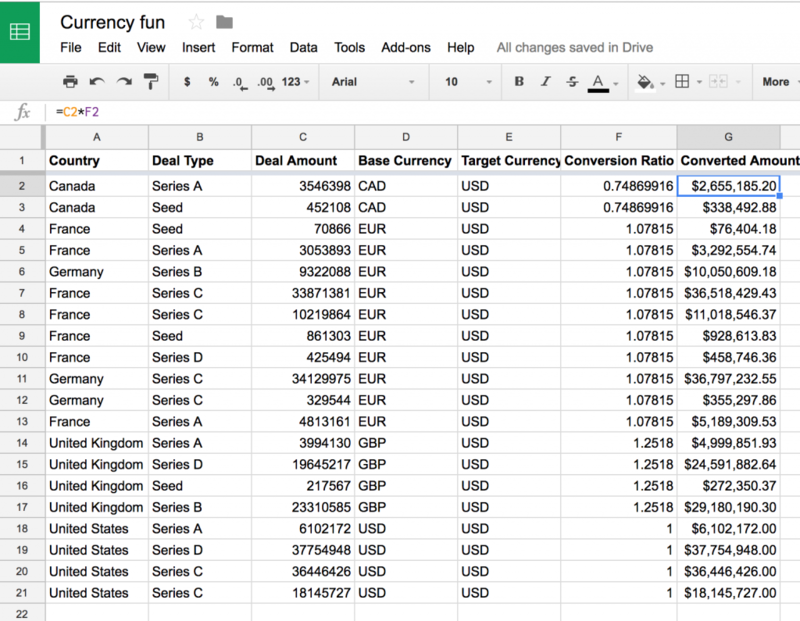 Now, for our table of VC deals we want to convert into USD, we could hard-code the currencies we want to convert into our formulas by group. Google Finance will return the current conversion rate and embed it as a number in the spreadsheet. Below is a screenshot of our Google Sheet with an escaped version of the formula next to the conversion rate. (Note what’s in the formula bar for the selected USD -> CAD conversion. And, once we’ve hardcoded all the formulas, all one would have to do is drag the corner of the cells down to fill in the rest of the table with the appropriate values. Just like the original “brute force method” this is all well and good if the number of currency pairs is small, there are few rows, and any re-sorting of the rows will be on a whole-sheet basis. 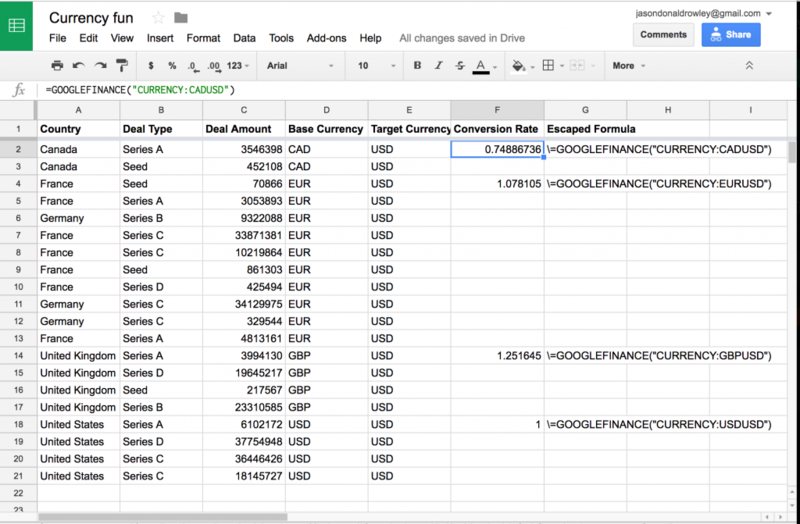 Alright, so we start with the general form of a currency conversion rate query in Google Sheets, the same as what was previously listed. Now, let’s look at our table and its columns. Hmmm… seems familiar… If only there was a way to join those elements into a formula. Enter Google Sheets’s CONCATENATE() function, which is similar to its cousin CONCAT(), except for the important fact that it lets you concatenate an arbitrary number of elements. Importantly, in Google Sheets, the output of the CONCATENATE() function is not simply treated as a string. Its output is usable inside another function. And as we can see, the result is “CADUSD” which is is the required pairing of source and target currencies we need in our formula. Now that we’ve proven we can build our one part of our formula using CONCATENATE(), let’s see if we can build the rest of it. Before showing the nice gif of how it all “just works,” give me one second to explain how one formula will be able to generate a conversion ratio for all of the currencies in our set. The D2 and E2 cell references are relative, which means that as I drag the equation down the sheet it will still pull from the cells in the two adjacent columns, but will take the value from each row. So that same equation, if applied to, say, row 3, would read from D3 and E3. From row 4, it would pull from D4 and E4, and so on down the sheet. One of the features of this kind of query with GOOGLEFINANCE() is that it dynamically updates as new currency exchange rate data becomes available. This can be viewed as either a bug or a feature, depending on your particular needs. In the event you don’t want these numbers to change, simply copy the contents of the columns that update dynamically and paste those cells in “as values”. (In Google Sheets, goto Edit -> Paste Special -> Paste Values Only [⌘ + Shift + V].) As this suggests, it just pastes in the alphanumeric values of the cells, and strips out the formula data. In the event that you still want to edit the formulas, which in variably you will, my suggestion is to duplicate the tab so you have one dynamic, editable version, and the static version you can work off of in later analysis. This has been a somewhat protracted way of saying that a little bit of abstraction makes for a time-saving and viscerally satisfying (at least from my perspective) data analysis experience. CONCATENATE() can be used outside or inside other functions in Google Sheets to build flexible, extensible auto-generating formulas in your spreadsheets, and I’m very much looking forward to a exploring how else it can be applied in the work that I do. This is also my first time offering up one of these tutorials, so if you liked it and want me to make more of these, please let me know! Future topics I want to cover include pivot tables, demonstrating a superior alternative to VLOOKUP() and INDEX(MATCH()), and a couple of others. One night this week I met up with one of my best friends. I don’t get to see him that often, but that’s alright. It’s one of those friendships that picks up right where it left off, even if it’s been weeks or months. He’s had a lot of opportunities, and so have I. This friend of mine is a bit older than me, and, accordingly, has moved farther on in his career. He’s one of these people with a solid job and, like, three side projects, all of which are doing phenomenally well. If he wasn’t so down to earth, it’d be all too easy to resent the guy’s success. Snap Inc., maker of the Snapchat app and face-mounted camera glasses called Spectacles, filed its S-1 with the SEC this past week, the first major step toward going public. I thought it’d be interesting to compare Snap Inc. to Facebook, considering that Snap CEO Evan Spiegel’s IPO roadshow message is that his company is “The next Facebook,” according to coverage in the Wall Street Journal. These DAUs are currently creating 2.5 billion “Snaps” per day. 60% of these users use the chat service every day. DAUs check Snapchat more than 18 times per day. Snapchat users spend an average of 25-30 minutes each day. I found some comparative figures from this article published in ZDNet in February 2012, on the day Facebook filed its S-1. Oh, and Facebook was also profitable and had comparatively more valuable assets and cash on hand at time of its IPO filing. It’s interesting to look at these figures, because it might hint at how Snap values and intends to position itself going forward. Whatever signal can be divined from Snap’s per-user-value figures points toward the company’s intention to aggregate attention and data in the same way as Facebook and Twitter did, rather than provide a simple service like Line and WhatsApp. In other words, the per-user value Snap Inc aims to show its investors is in the same ballpark as other massive social platforms of previous generations. As a platform, Snapchat is compelling for a number of reasons, including its unique augmented reality components, an innovative user experience design paradigm and, importantly, a strangle hold on users’ attention by way of its ephemeral messaging and video play-back features. Whether Snap Inc is able to capitalize on its strengths and deliver on its potential value as a platform is still uncertain. However, I remain skeptical that Snap Inc will be the next Facebook. I doubt Snap will attain Facebook’s scale or scope, and I’m not the first to point out that Snap’s current price feels a bit expensive. 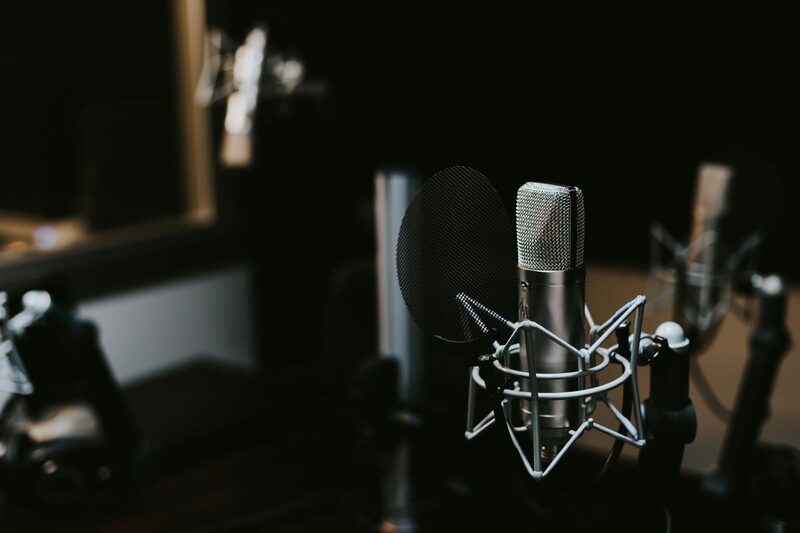 If you’re involved in the tech industry and like to listen to podcasts, chances are you’ve already heard the standard-issue stuff that consistently ranks at the top of iTunes. Shows like Exponent (of which I am particularly fond), the a16z Podcast, Startup from Gimlet Media, and even NPR offerings like How I Built This and the TED Radio Hour are probably old hat.